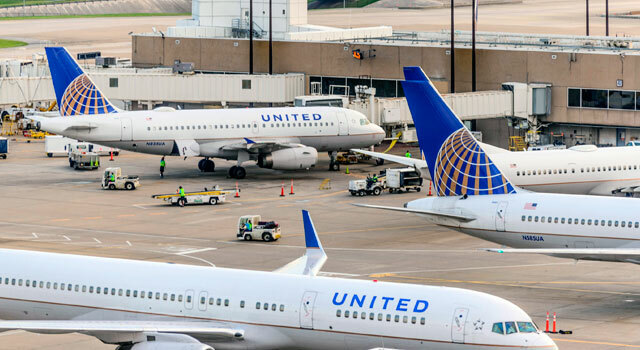 Use this website to quickly find the most important information about Houston George Bush Intercontinental Airport: Flights (Departures, Arrivals and Delays), Parking, Car Rentals, Hotels near the airport and other information about the houston airport. 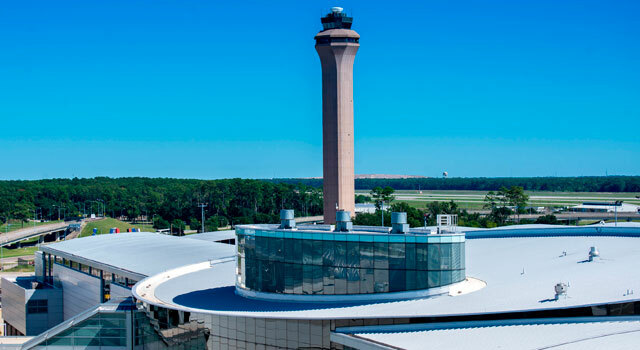 Plan your travel to IAH Airport with the information provided in this site. Check Houston Travel Guide at Bautrip for more information about Houston. George Bush Intercontinental Airport Houston (IATA: IAH, ICAO: KIAH) is 23 miles north of downtown Houston, Texas. It is located between Interstate 45 and interestate 69 / U.S Highway 59, inside the Houston city limits in the Aldine area, and is adjacent to Humble. 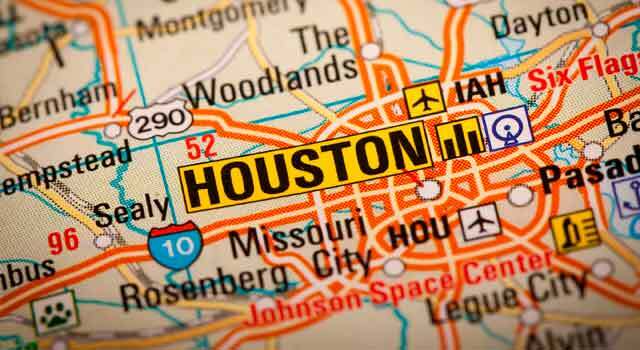 Houston Downtown is 23 miles (30-minutes drive) from the airport. It is frequently referred to as Houston Airport. With more than 30 destinations in Mexico, Bush Intercontinental offers service to more Mexican destinations than any other U.S. airport. Is also the headquarters of United Airlines, and Bush Intercontinental is United's largest hub, with 800 daily departures. Houston Airport is named after George H. W. Bush, the 41st President of the United States. It has gates from A1 to A30 located in two groups: A1-A15 and A17-A30. Handles all non-United domestic and Canada flights, international departures and some United Express flights. The only airline that operates at the terminal is United. It serves all United Express flights except International arrivals. It has gates from B1 to B88 divided in different concourses. It has gates numbered from C1 to C45 divided between South and North concourses. It serves as the United Airlines main base of domestic operations. George Bush Airport Terminal D does not serve intentational arrivals at the moment, thus are served in Terminal E. It has 12 gates. It is planned to expand the terminal until 2021. Is the newest Terminal and has gates from E1 to E24. It serves all United international flights from all other terminals and some domestic operations. The Skyway is an elevated train that connects all terminals for those passengers with connecting flights, without having to re-enter security. There is also an underground train (Subway) that connects all terminals and the hotel for all people, passengers and visitors. See the inter terminal transportation options. 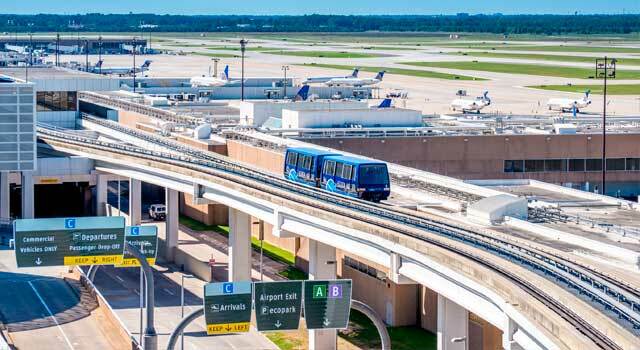 - Bus: The METRO public transportation company offers several bus routes to and from Houston Airport. - Airport shuttles: Several shuttle bus companies are at your disposal. 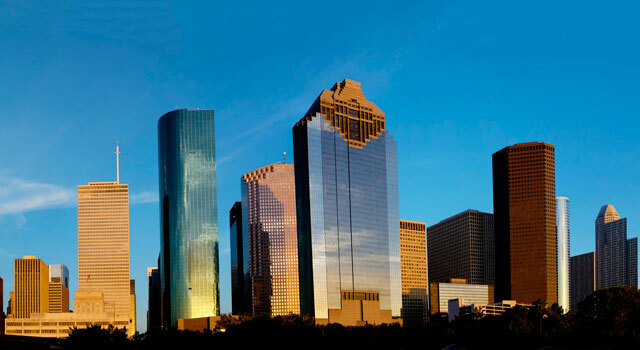 - Taxis: Transfer to downtown Houston within 40 minutes. - Car rental: Book your car through our search engine. - Mexico City, Cancún, London, Calgary and Frankfurt are the busiest international routes from Houston Airport. - Los Angeles, Denver, Chicago, Atlanta, Dallas and San Francisco are the busiest domestic routes. For items lost in the airplane, please, contact with your airline. × Best Prices in Car Rental! Search in our car rental booking engine!